I am much happier with my second attempt at dyeing this weekend. It’s cheerful and bright – my daughter said it was like summer flowers. 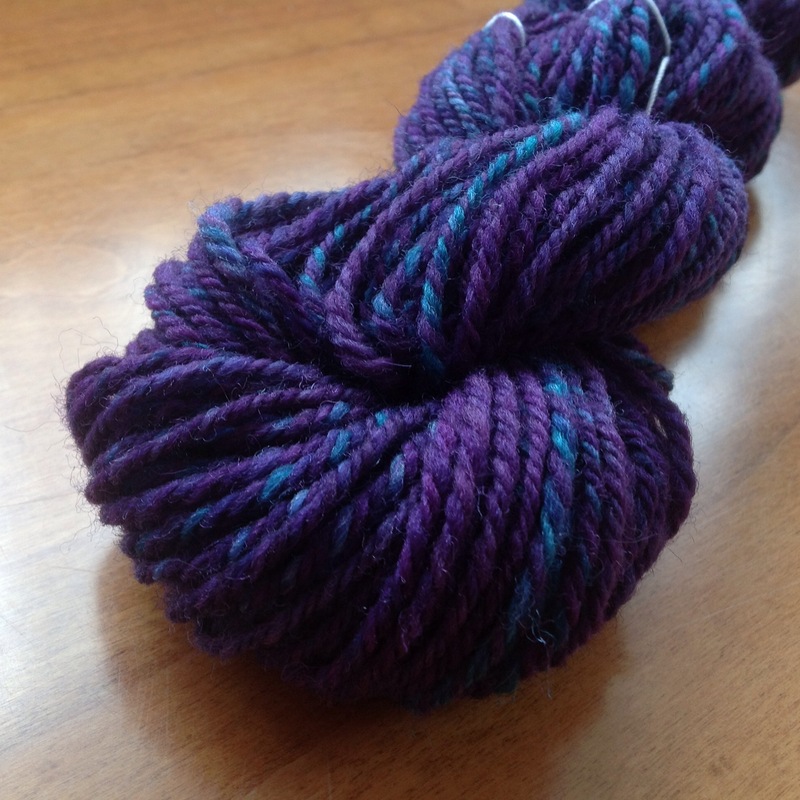 The fibre was what was left from my original purple sock yarn project – around 150g of superwash merino/nylon mix. I think this will again turn into sock yarn, possibly turning into some socks with a feather and fan pattern. A brief thank you to the local Brownie pack – again I was able to spend dyeing as they were keeping me child-free for the day! It’s a hundred years of Guiding this year, so I get another day to play in a few weeks time when it’s ‘Party in the Park’ – just in time to top up with fibre for the Tour de Fleece. Looked pretty good on the fibre too. 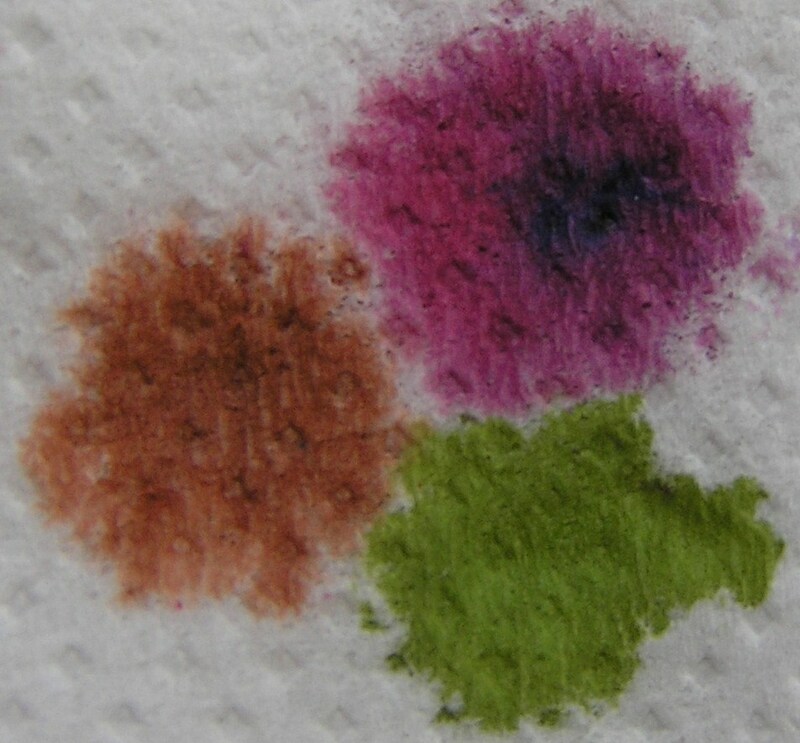 Use a tiny tiny tiny bit of dye powder at a time. Really. Childfree time + Sunshine = another go at dyeing! This attempt looks slightly more like I had in mind first time round, in that the colour is much nearer the purple I was planning. As you can see I have gone wild and purchased a new steamer and a pack of squirty bottles, both of which made the process easier. I mixed up some hot pink and blue dye powder in an old yogurt pot and added the vinegar. I used a funnel to pour this mix into the bottle, then added water. My plan was to put some dark purple stripes on the fibre, then add more water to dilute the colour and add more and more progressively lighter stripes. Next time I will believe the instructions – the colour of the first stripe and the next diluted stripe were pretty much identical. By the time I got to a pale purple there was so much liquid on the fibre it was swimming in the stuff, so I think it all blurred into one by the time it was cooked! There are some positives – I like the colour, it hasn’t felted and the dye has gone all the way through the fibre this time. Also, I have some purple freckles on my right foot – covered up everything else despite the baking heat, but forgot I was wearing flip flops! 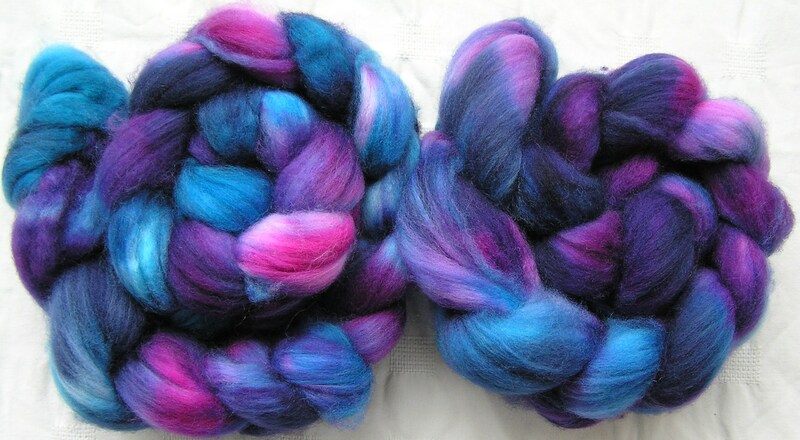 I tried out my Ashford Dyes this weekend and this is how the story ended, with around 160g of bluey/pinky/purple fibre. 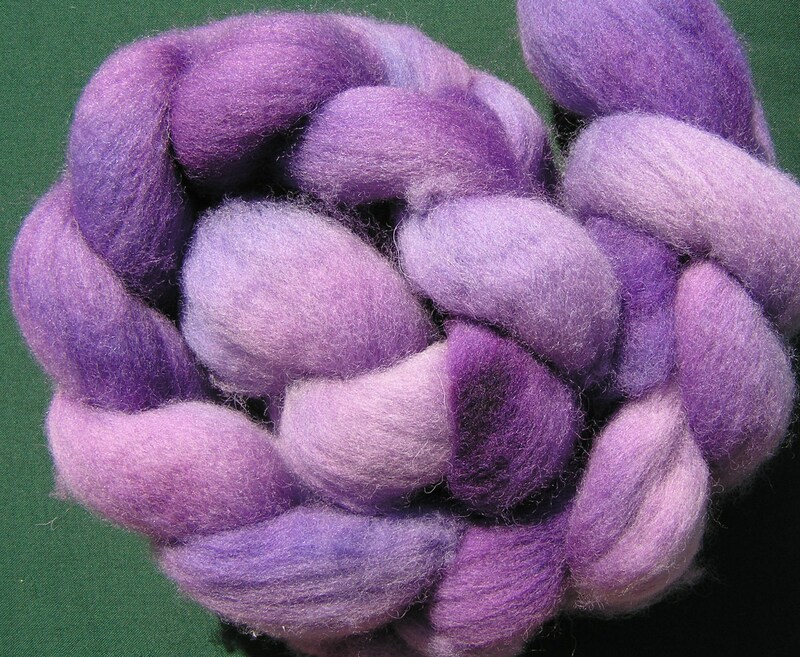 I learned a lot by trial and error (there’s a blow-by-blow account below in case you are thinking of having a go) and I have added some links to other sites with dyeing info that I found useful. I wanted to end up with yarn to make socks – specifically these Leyburn socks www.ravelry.com/patterns/library/leyburn-socks for a SAL/KAL in the LimeGreenJelly group on Ravelry. 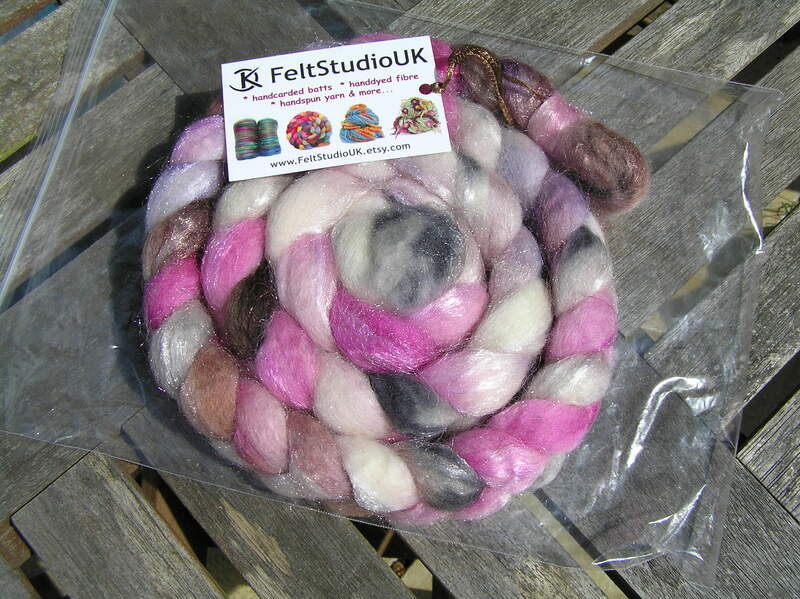 I’d already spun some lovely BFL/Sparkle fibre but got nowhere near enough yardage. I knew I wanted something purple-ish and wanted fairly rapid colour changes. 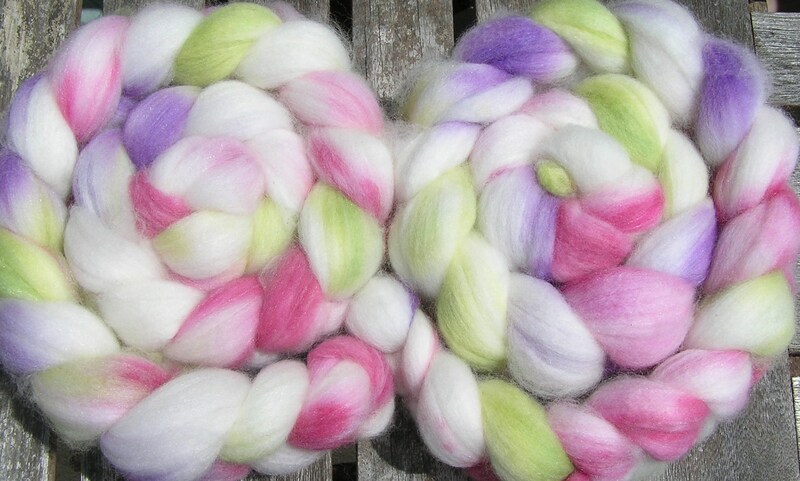 I bought 300g of superwash merino/nylon blend from www.worldofwool.co.uk in the hope that I couldn’t destroy superwash! I decided to use around half this amount for my dyeing experiment. I decided to tie the fibre into two skeins. I was going to work on an old round garden table so didn’t have enough space to lay the fibre out in lengths. Instead, I split the fibre into two lengths and lay them in circles, then tied them with acrylic yarn. I soaked the fibre in warm water in a bucket for about half an hour, then gently squeezed it out until it was damp rather than sopping wet. Handling the wet fibre was tricky – it suddenly seemed all thin and slippy, like a fluffy cat caught in the rain! 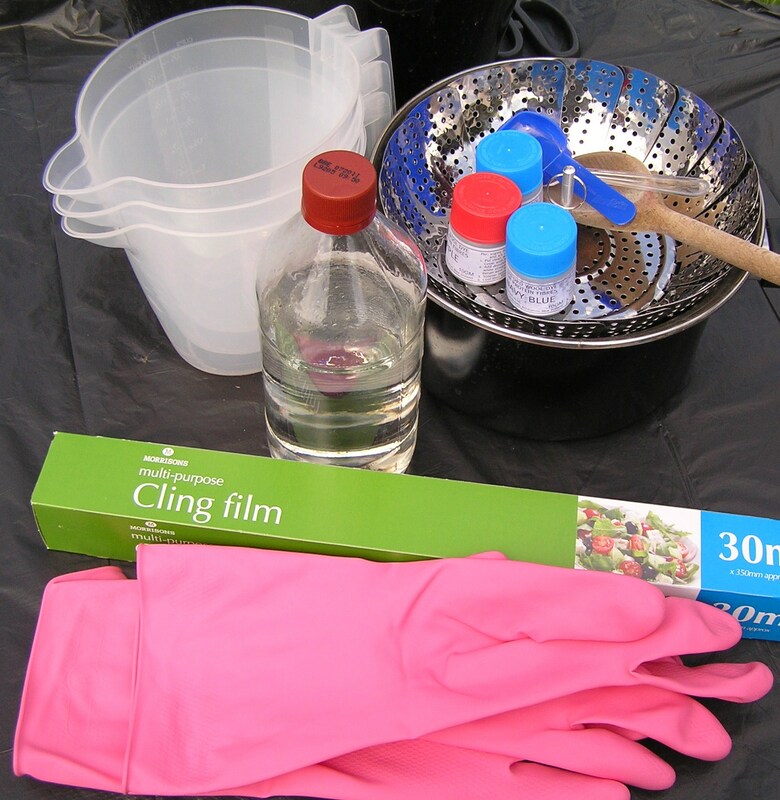 I had all my equipment at the ready (I bet Morrisons never considered using cling-wrap for dyeing when they put ‘multi-purpose’ on the box…) With hindsight, some sort of squirty bottle would be better than a cheap wobbly jug, or maybe a syringe without a needle might be useful for applying the dye solution. I rolled out two strips of cling-film, then plonked the damp fibre on them. At this point it was a bit like slapstick comedy as the wind was making the cling-film flap all over the place and as fast as I unstuck one piece so another would tangle. Around this time I also decided the dog was far too interested and put her inside the house, much to her displeasure – but explaining a pink and purple dog would be hard to do! 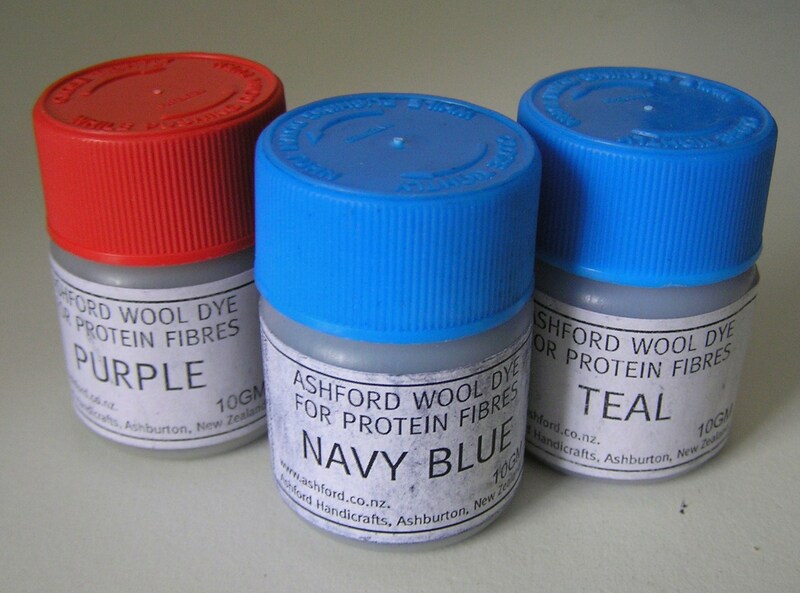 I had decided to use these three Ashford dyes (the pots are tiny, about the size of a pot of nail varnish). I had envisaged an all-over navy/purple yarn with small highlights of teal. Each pot is 10g which it says is enough to dye a kilo of fibre to full intensity (or one flat teaspoon plus 2 tablespoons of vinegar will dye 200g). Despite my cynicism, I can now tell you that this is definitely true – the colours were amazingly vibrant. 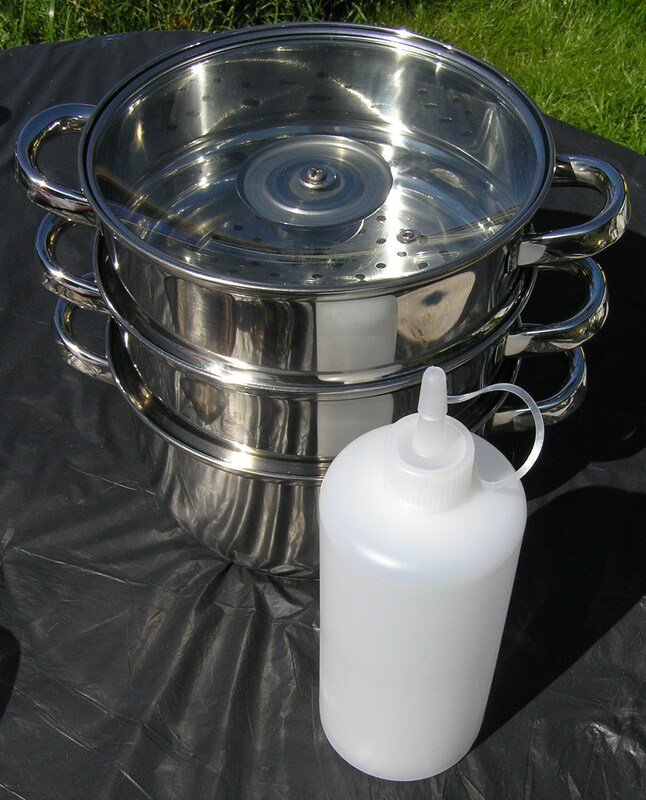 I used three plastic jugs and added half a small plastic teaspoon’s worth of dye powder to each one and then two tablespoons of white vinegar. 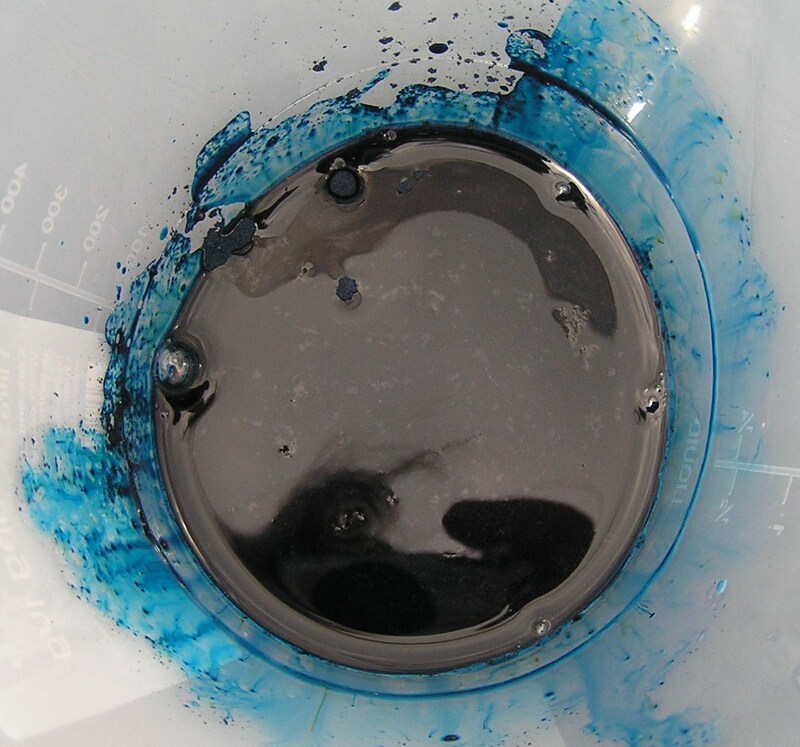 Here’s the dye liquid at this point – a jug of purple, then navy blue, then teal. 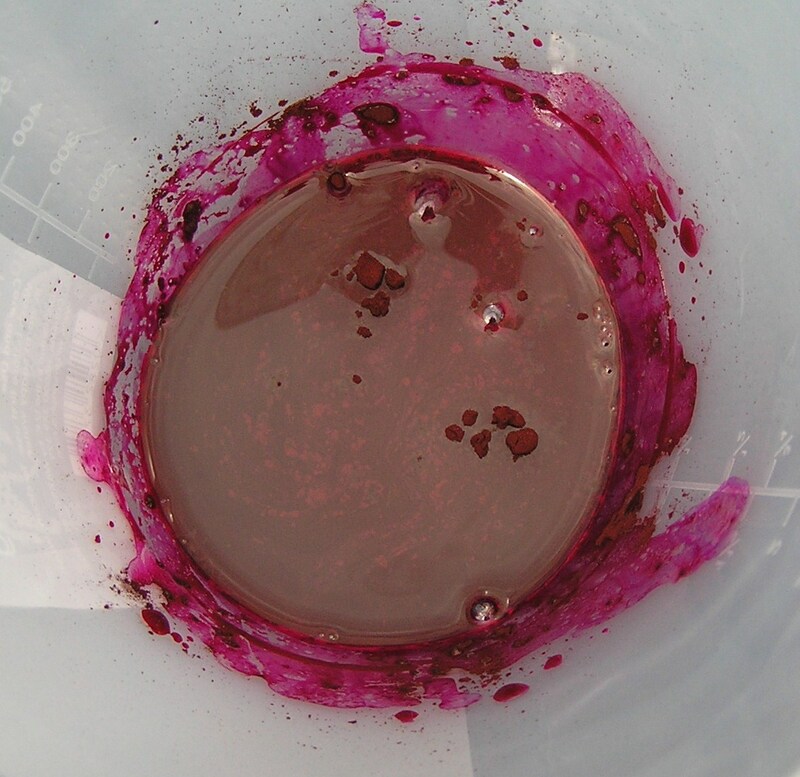 The dye pot definitely said purple on it, but the result looked very pink to me… I added warm water to each jug – I dithered for a long time about how much to add and in the end made it up to the half-pint mark on each one. 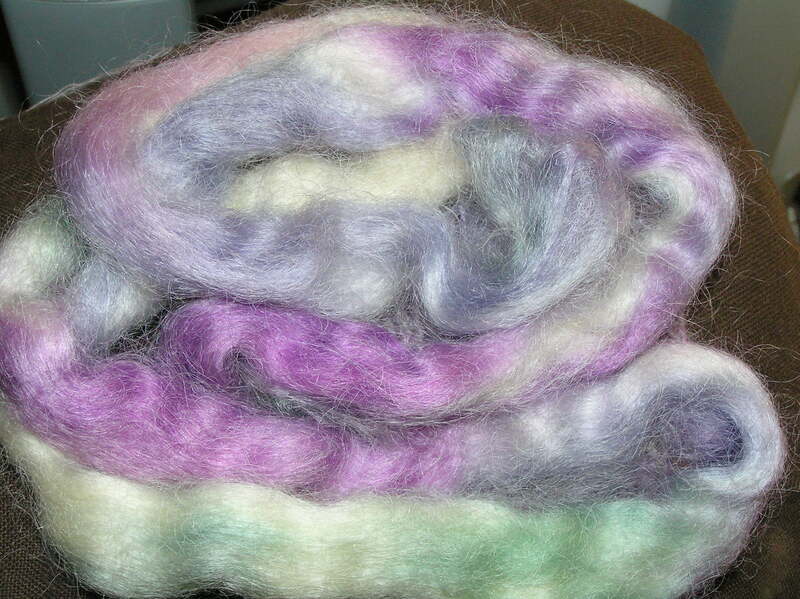 Then I started adding the dye to the fibre. Easier said than done! I realised that pouring it would end up with great big patches of colour, so I used a very professional technique – I spooned it on with an old scoop from a Horlicks tin! I added narrow stripes across both bits of fibres wherever I fancied. I was taken aback by the strength of the colours and the non-purpleyness of the purple, so then started mixing the jugs of dyes together – adding blue to the ‘purple’ improved the colour a great deal. I now appreciate why indie dyers say ‘unrepeatable colourway’! Maybe another time I would try mixing the colours once I had mixed the dye and vinegar. Having spooned more dye onto the fibre, I diluted the dye mixes further with more water and filled in the gaps that remained on the fibre. There were some bits where the dye hadn’t soaked right the way through, but at the time I thought the whole thing was going to look very gloomy and sombre coloured, so figured that a little white here and there might soften up the colours when it was spun. I then folded in the long edges of the cling-film and rolled up each fibre sausage. I wrapped each parcel inside more cling-film and cleared up the equipment. 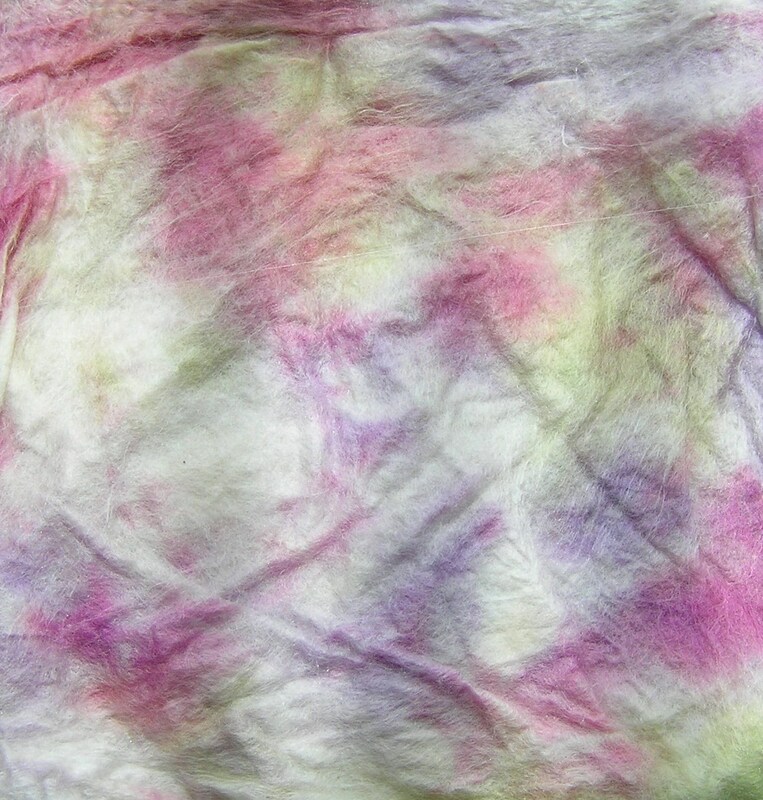 I had dye left over and was not sure how to dispose of it, so at the moment it is in an old plastic milk bottle – maybe it will keep and can be used to dye more fibre? I then steamed the fibre to set the colour. 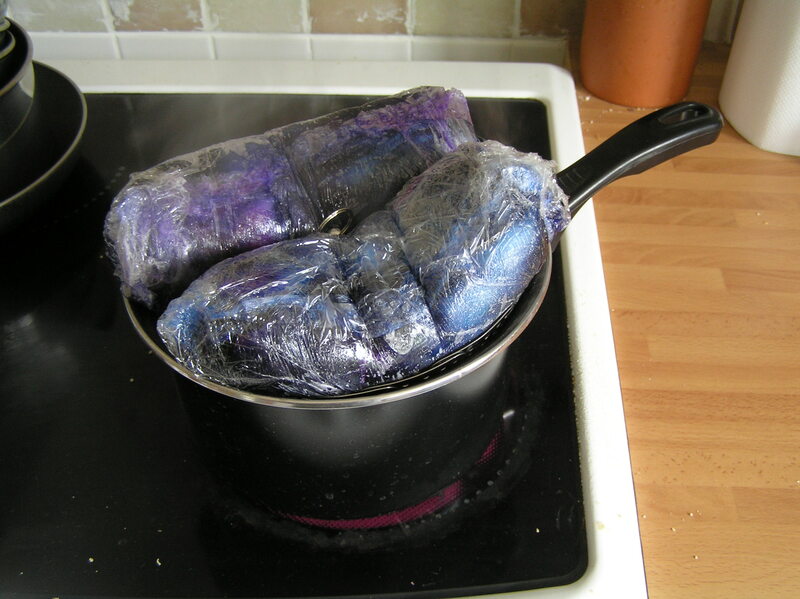 I had bought a collapsible steamer tray that fits within a saucepan, but next time I will invest in a proper stacking steamer – if you’re not careful the ’petals’ of the collapsible steamer rip the cling-film and the dye starts to escape. The fibre sausages swell up as they cook and luckily I didn’t poke a hole in the cling-film until after about 40 minutes of steaming – I decided that must be a sign that it was ready! I let the fibre cool for about an hour, then ripped off the cling film and rinsed the fibre in a bucket of warm water – the water remained completely clear. I wrapped the fibre in a towel and squished out as much water as possible, then hung it out to dry. (Eventually I got bored and dried it with a hairdryer, I’m sure this is not on the list of things you should do, but I wanted to see what the finished fibre was like)! Finally, I played with braiding it – one piece I crocheted into a chain, and the other I made into a plait. Now all that’s left is to spin it and knit those socks! Earlier in the year I bought a pack from http://www.thefibreholics.co.uk/. 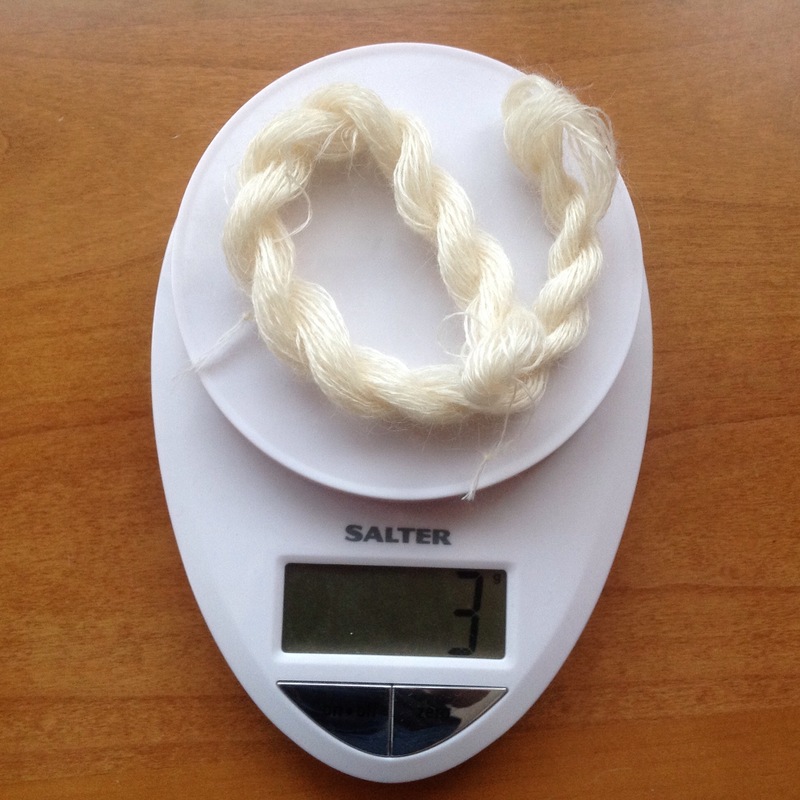 The packs give you a range of different fibre (or yarn) samples – usually about 20g from five or ten different suppliers. There were lots of lovely goodies, but one of my favourites was called ‘To My Valentine’ by Juno Fibre Arts and I bought a full 100g from her Etsy shop. It’s combed Wensleydale top in lovely violet and green shades and stood out because it was different from the pinks that most of the others had gone for (there was a Valentine theme to the pack). 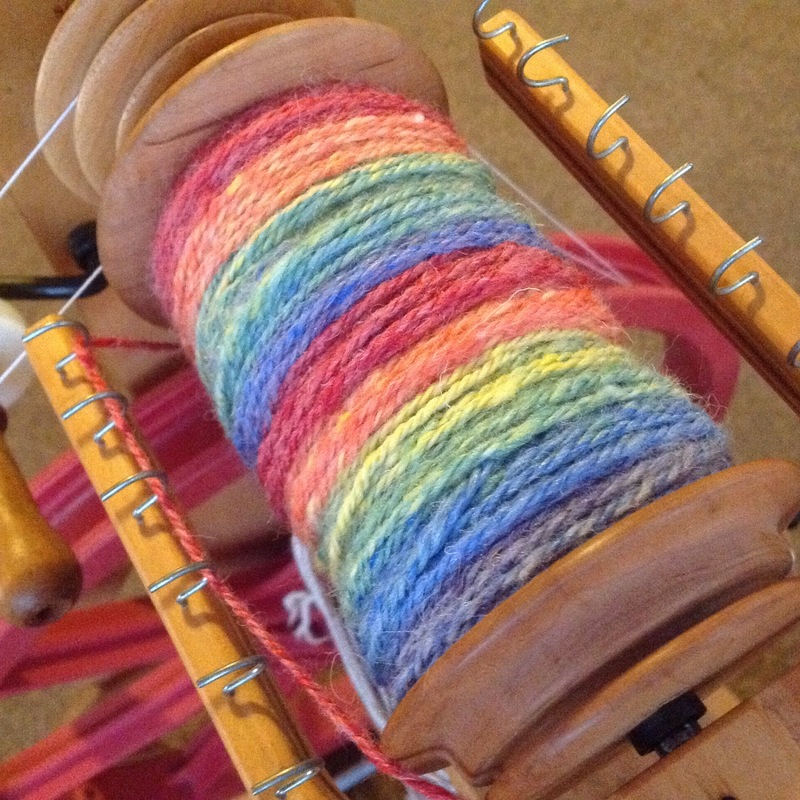 I’m spinning away at the moment and will probably navajo ply to keep the colour changes. If it looks good when it’s done, I think I’ll enter the yarn in the Rare Breeds Show at the Weald and Downland Museum in July. There is a category for ‘fancy’ yarn (I love the use of the word ‘fancy’ here, it hints that it’s not proper wool, it’s been mucked about with and is an insult to sheep). Nice chap brought me two parcels today – goodies from www.handspinner.co.uk and www.wheeldalewoolcrafts.co.uk. 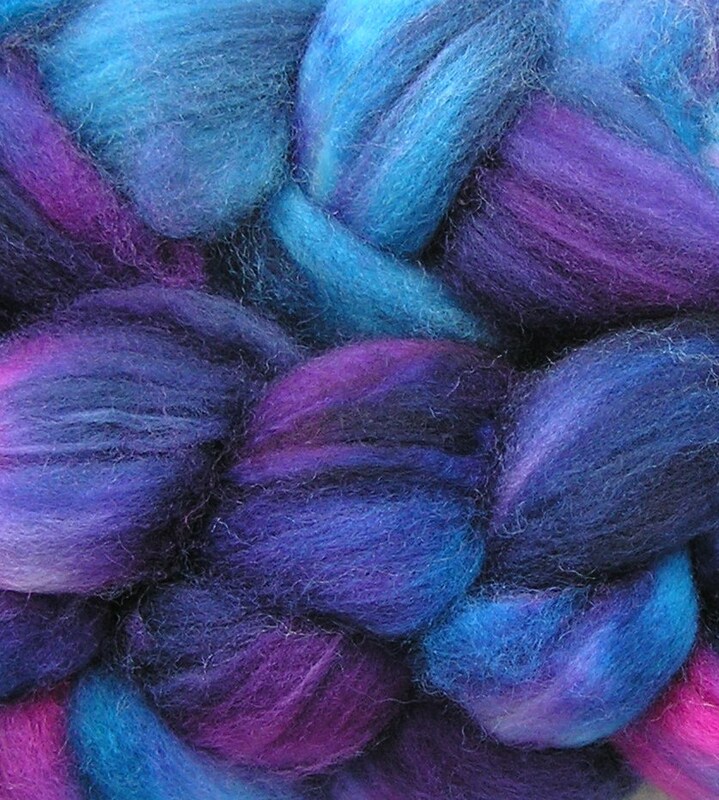 Hopefully I will have time next weekend to make a start on dyeing some fibre.